At a time when populism is in vogue, the Nobel Laureate has gone in the opposite direction. We need to read her and listen to the people she hears. Svetlana Alexievich was born in western Ukraine in 1948 to a Belarusian father and Ukrainian mother, both of them rural schoolteachers. She grew up in Belarus and, after graduating from high school, worked at various newspapers before studying for a journalism degree at Belarusian State University. Alexievich graduated in 1972, but she eventually abandoned the journalistic strictures of chronology and contextualization in her first book, War’s Unwomanly Face, which was published in Russian in 1985, the first year of perestroika. For that book, Alexievich interviewed scores of women rarely given the chance to be heard, and then edited their stories about personal and collective tragedy into a collage of voices that openly challenge the heroic Soviet myths of the Great Patriotic War. More than 2 million copies were eventually sold. When Alexievich was awarded the Nobel Prize in Literature last year, it was an acknowledgment of what she had already proved in each of her five books, collectively known as the “Red man” cycle: Her writing is sui generis, blending the force of fact with the capaciousness of fiction to create a new, vital literary compound. In her Nobel lecture, Alexievich offered this characterization of herself as a writer: “Flaubert called himself a human pen; I would say that I am a human ear.” What she detects are the moments when a voice cracks, breaking through reticence and occlusion, saying something contradictory, enigmatic, strange. When T.S. Eliot was writing the poem that became The Waste Land, he gave it the working title “He Do the Police in Different Voices,” a phrase plucked from Dickens’s Our Mutual Friend. “I ‘read’ voices,” Alexievich has written. She goes from person to person, voice to voice, hearing people talk about their lives in different voices, becoming individuals. 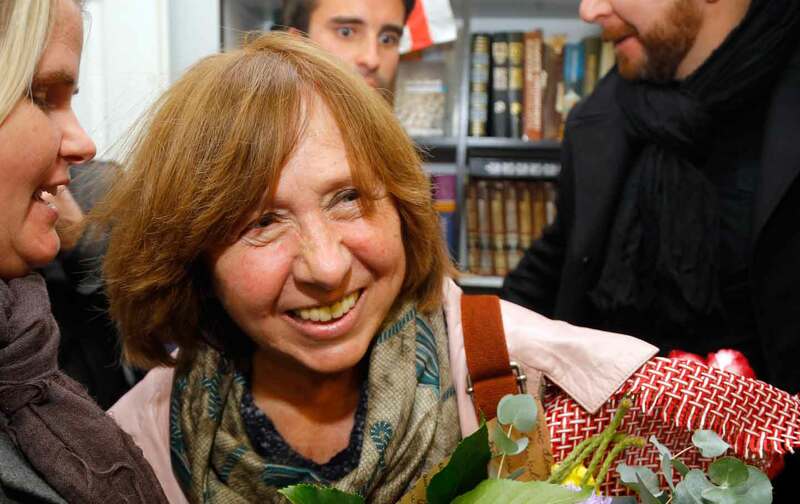 At a time when populism is in vogue, and populist politicians claim to speak for “the people,” Alexievich goes in the opposite direction: People should be allowed to speak freely for themselves. We need to read her, and listen to them, in all their variety. The following interview was conducted in May in English and Russian and translated by Bela Shayevich. When did you start gathering stories—not necessarily to write them down, but just to gather them? I’ve been doing it since childhood. I used to live in a village, and I always loved listening to old people. Unfortunately, it was always women who were talking, because after the war very few men were around. I spent my entire life living in the village. The village is always talking about itself, people are talking to each other as the village makes sense of itself. If we want to talk about beginnings, there they are. My Ukrainian grandmother would tell amazing stories. She lost her father, and as children we would always listen to her stories. When did you sense that you should start writing stories down? After I graduated from the journalism department—because even though journalism is a good profession, for me it was very constraining. It focuses on the surface, banalities, events, and I wanted to spend a longer time talking to people in depth, and to ask them about truly important things, like love, death, and war. Did you come to have this attitude before school, or during it? Well, first of all, before my father went to the war he was studying in the journalism department, and after the war he returned there, so for me there was never a question about what I would do for a career. I was always meant to study the humanities; I was no good at math or sciences. When it came time for me to work it was Soviet times, and journalism wasn’t that free or interesting of a space. There was a lot of censorship; it was difficult. At the end of your third book, Voices From Chernobyl, you write that the Zone—the officially designated exclusion zone around the site of the destroyed nuclear reactor—is “a world within the rest of the world.” You then write that it is “more powerful than anything literature has to say.” You make a similar remark in your Nobel lecture when you paraphrase your teacher, the Belarusian writer Ales Adamovich: “You must give truth as it is. A ‘super-literature’ is required. No artist can live up to reality.” What, then, of literature? It’s not that I got frustrated with literature per se, it’s just that the relationship one has to literature as a young reader changes. And don’t forget that I did end up working as a journalist for seven years and listening to people’s stories. When I heard those stories, they were more powerful than anything that you would read in fiction. It’s not just me; it’s other kinds of artists, musicians—everybody is searching for new forms. It’s because of the nature of our times: So many things are happening and changing at the same time. It’s not a time when literature is only about great heroes. The little man has taken center stage, and there needs to be new ways of talking about that. When I was traveling around to all the villages, talking to people when I was a journalist, I really fell in love with the everyman, the ordinary people. They became more important to me. It’s not that I don’t socialize with the intellectuals—I talk to them too. But the so-called ordinary people took center stage. They’re just regular people, but they are absolutely amazing. This little man, these ordinary people—who are they? When did they appear on center stage, and what would new forms allow us to understand about them? The little man or woman, they’re not heroes. They’re not great leaders. They are everyday men and women—ordinary people. I was thinking of little people, because I was thinking: Why do ordinary people disappear without a trace? Why doesn’t anyone ask them anything? Nobody asks them what they think about grand ideas. They’re just asked to die for them. When I started asking them, I realized how stupid it was to call them “little people.” We’re all equal heroes of our own life. The stories of many of them shake you to the core. Their human experience is great experience. I can’t speak for art as a whole, but in my genre, they expand the human knowledge. And after working for so many years, I never say “little person.” I never think in those terms. And I think they took center stage during World War I, when masses of people took part in history. In “Remarks From an Accomplice,” the first section of your new book Secondhand Time: The Last of the Soviets, you write: “I’m searching for a language.” You’ve finished this book, but are you still searching for a language? Every book requires its own language. For instance, this cycle, the “Red man” cycle—that’s one thing. The new book I’m writing now is about love. It demands a completely different kind of language than in my previous books. I want to capture every facet of a person. There’s so much that goes into how people talk and what they say. How they’re speaking depends so much on what they were doing, what they were thinking about, what they were reading. It even depends on whether I’ve come to talk with them in the evening or in the morning. A lot goes into it. I understand that. Yet contextual tidbits aren’t present as facts in the text. If they’re important for finding a language, then why omit them? In the past, I tried to keep them, but when you have the stories accumulating, I’ve found that it doesn’t work. All those circumstances seep into the language itself. I will sometimes give notes on how a protagonist is behaving, what they’re doing emotionally, but the text has to be very concentrated, and those kinds of details dilute it. Other books in the genre, such as those of Adamovich, will have more text directly from the author; but in my opinion, those are the weakest parts of the book, because next to the stories that the protagonists are telling, they’re nothing. They’re not nearly as powerful. In your first book, War’s Unwomanly Face, you explain that you’re writing a history of sentiments, or emotions. What in your mind distinguishes your work from that of nationalistic and propagandistic writers, who also traffic in sentiment and the sentimental, its source for them being the notion of the ideal age or place destroyed by marauders? When it comes to more propagandistic writing, what sticks out about it is ideology. For me, the history of human emotions is an alternative kind of history: It’s separate from big history, concerns the kind of things that history proper won’t deign to touch. Feelings are what disappear from these kinds of accounts…. When it comes to big history, stories about the war—they focus on major events, but how people lived through them, what they felt, is absent. And for me, I’m writing a history of human life—not ideology, but life itself. If we’re talking about Secondhand Time, I’m writing a history of domestic socialism: how socialism lives in the soul, in the everyday, and not as a grand idea. How does one write a history of sentiments without being sentimental? My stories are full of emotions: There’s a gentleness toward life, an awe toward life, a terror toward life. It’s a lot of emotion, but it’s not sentimentality. And I know in the case of true grief, there aren’t tears or displays of emotion. People sit very quietly and speak very quietly about what they went through. They are bewildered at what people are capable of doing to one another, at what they’ve been through and survived. When somebody is talking about death, what sentimentality can there be? For me, emotion is a path toward self-knowledge, not just an occasion to cry. Thereafter, I was more than once faced with the coexistence of two truths in the mind of the same person: a personal truth repressed in the depths of conscience, and a truth that’s borrowed, or contemporary, latent in the spirit of the times, in its imperatives and requirements. The first was hardly ever able to resist the pressure of the second…. Each time, I was struck by the mistrust between what was simple and human and the desire to replace life with an ideal image. A simulacrum. It’s one thing for someone to sense internally that mistrust—the contradictions between the personal and the public—and another thing to voice it, especially if he or she lived in the Soviet Union with its party lines. What made it possible for people to voice those contradictions to you? Not just to think them, but to feel the need to voice them? In the Soviet Union, this was just a matter of ordinary, everyday experience. There was the subjective experience—what was happening to people—and then there was the canon, the script that their lives supposedly adhered to. When I would first begin talking to people, what they would tell me would be according to the script—saying what they were supposed to say, like a man telling a story the way a man is supposed to tell a story—and it would be my job to get them to remember and to tell their own personal story. And it would be very difficult. In your Nobel lecture, you say, “It always troubled me…that truth is somehow splintered.” You seem to be suggesting that truth doesn’t fit into one heart or one mind; it’s varied and strewn about the world. Yet isn’t a splintering of sorts also the genius of the polyphonic texture of your books? We hear variations on truth throughout them: variations that people have lived, variations in the mind and stories of one person and across the minds and stories of different people. You lament the fact that truth is splintered, yet your method depends on that splintering. What do you make of that? From my childhood, I remember talking to people, and the stories they told me were more interesting than what’s in books. People tell me extraordinary things, and I realize that there is nothing in the world about which we know anything for sure. Each person screams out his or her truth. You have to listen to everyone. As an artist, you have to listen to both the executioner and the victim. I’m trying to show the multiple variations of the entire life. I don’t want to be like other authors and say that there are only a few story lines in literature. A story is like a human face. We have as many stories as human faces. You might have similar facial features, but they’re all a little different. In “Remarks From an Accomplice,” you describe a mother who went to Chechnya during the first war there to bring back her son, because she didn’t want him to kill people. “The government no longer owned her soul,” you write. “This was a free person.” Do you still meet people like that mother, or could she exist at only a certain point in Soviet, and now Russian, history? Have people like her become anachronisms? It’s a complicated question, because I will say that during Yeltsin’s time, when there was democracy, mothers really did stop believing in the propaganda and would take it upon themselves to travel to Chechnya to rescue their sons, their children. The most amazing thing is that Chechen women would help them. Today, when mothers receive the coffins of their sons, Russian soldiers who were fighting in the Donbass in Ukraine, none of them want to be interviewed. It’s very rare to find one willing to speak to journalists. In despair, a journalist friend of mine asked some of them why they wouldn’t talk, and the women replied that if they talk, they won’t receive the death benefits—the money, the good money, they receive after their sons die. I have never encountered that before. Not in Afghanistan. In the days of the Afghanistan war, mothers would seek me out, wanting to speak to me. They were different. But now, in Putin’s Russia, where fear has once again taken over, it’s hard to find a free person. If I were writing this book now, I can’t imagine being able to get the kind of interviews I did in Secondhand Time. Now there’s some kind of perversity, there’s this element of money. And day in, day out, Russian television is telling the people that we’re surrounded by enemies; we’re in a besieged fortress. Something is happening to the people. They’re different now.